This grand looking Burnham Studio has been installed in our customer’s garden in Orford, Suffolk to use as a garden retreat for her and her family and friends to enjoy her garden from. The apex roof has been adorned in construction grade cedar shingle tiles, which give a durable yet natural protective covering. These tiles have been paired with our Valtti Paint system in a colour called Pebble, which is a neutral colour to blend in well with the customer’s garden. Internally, there is painted matchboard lining on the walls, full insulation, two fanlight windows for ventilation, draught excluders in the doors and windows, and an electrical pack with a heater, all of which will make it perfect for year-round use. 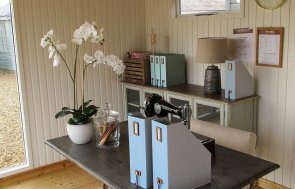 Our range of Garden Studios are lovely buildings, and our customers use them for a range of reasons, from an art studio, hobby room or office, to a relaxation or entertainment room. If you would like to see our buildings in person, we have six show centres across the country, and we have a wide range of our buildings at each site for you to view and walk around. If you are unable to get to one of these sites, you can also Contact Us online, by requesting a callback or by calling 01760 444229 and speaking to one of our helpful team.